I’m in it! The gentle flow of it and the zany spin of it. I am deep in the groan zone of transition – marriage separation, emerging new business and the birth of the second half of my life. If I had posted this a couple of days ago when I first became aware that what I was experiencing was groan zone related, this entry would would have communicated an intense amount of stress and pressure related to all the normal groan zone challenges – resources, relationships, fear, questions around whether the vision for the new directions are even achievable. 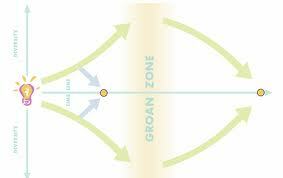 But this is the beauty of the groan zone. Wait a day, or sometimes a few hours or even just a few minutes, and the gentle flow of the path, or the zany edginess of it, will take you different place – thankfully. So I write this post from a place of greater calm, groundedness, faith and trust in the path that I have embarked upon in this second half of my life – a journey that requires a greater amount of trust and faith than I have ever experienced. On this path is the new company: Shape Shift Strategies Inc. What will it do? Good question. I’m asking it too, while knowing at the outset it will be the vehicle to continue my craft as a process artist – hosting, consulting, coaching – providing services to existing and new clients, working collaboratively with colleagues from the Art of Hosting network. As I continue to step more and more boldly into bringing my healing gifts to the shifting shape of the world and the regeneration of its people…. well, who knows how Shape Shift will support this. In this transition, my life is full of unresolved details – a new website (ready in a couple of weeks has been my mantra for awhile), attracting the resources for a move so full separation is possible, writing a book and book proposal for Healing Across the Ages: Releasing the Hold of Family Secrets, staying on top of client work, spending extra time with my dad, since my mom is in long term care for dementia, following a minor surgery that put him in the passenger seat literally and finding time to do the things that nourish my soul: being inside of nourishing relationships, meditating, exercising and spending time with my kids. In the bad moments…. the tension is palpable. It is important not to ignore those moments and not to get lost in them either. Fortunately trust and faith carries me far and the work of this second half of my life is so compelling I don’t have time or inclination to be lost for long. I am able to focus on the flow rather than where the current is stuck. Knowing all this strengthens my journey, builds my capacity and deepens my ability to stand boldly in my purpose.